I have decided to put up a page that you can post your testimonials and reviews of the free accounting spreadsheets. If you have used them before or are currently using them, could you take a moment to tell others what you thought of them? Good or bad...I'll post all of your reviews! Was the spreadsheets helpful? Would you recommend them to a friend? 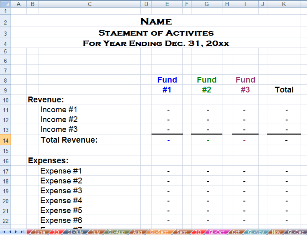 Could you take a few minutes and give a quick review of the accounting spreadsheets? Your opinion will appear on a Web page exactly the way you enter it here. You can wrap a word in square brackets to make it appear bold. For example [my opinion] would show as my opinion on the Web page containing your opinion. See What Other People Are Saying About the Spreadsheets! Where are the free spread sheets, I couldn't find them. Signed up and confirmed email. NOTHING!!!! Is this a scam? I couldn't find any free spreadsheets for church bookkeeping. I don't think you really meant that when you said they are free. Thank you.